A beautiful, illustrated, aspirational companion journal to Shonda Rhimes's New York Times bestselling memoir Year of Yes. In her mega-hit book Year of Yes, Shonda Rhimes transformed her life by saying one small word: YES. Now, in the perfect complement to that instant New York Times bestseller, The Year of Yes Journal allows you to chronicle your own Year of Yes. The journal is broken out month by month, day by day, with each month highlighting a theme ("Yes to Doing," "Yes to Help," "Yes to Who I Am"). Daily, you can track what you say YES to and keep notes about how that decision has made a unique impact; monthly, you will find journaling prompts for reflection around that specific theme. With a check-in section at the six-month mark, as well as at year end, and encouragement from Shonda along the way, you will have ample opportunity to track how YES has transformed your daily life. This inspirational--and aspirational--journal is bound with a beautiful, gold foil-stamped blue case. With memorable aphorisms from Year of Yes placed throughout and gorgeously illustrated, this stunning journal is a must-have keepsake that brings a bit more YES to your life. 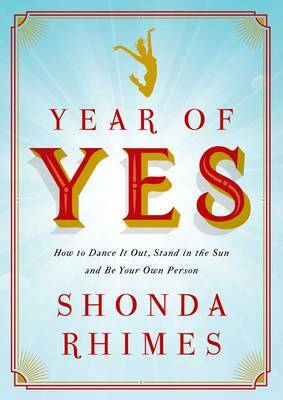 Buy Year of Yes Journal by Shonda Rhimes from Australia's Online Independent Bookstore, Boomerang Books.